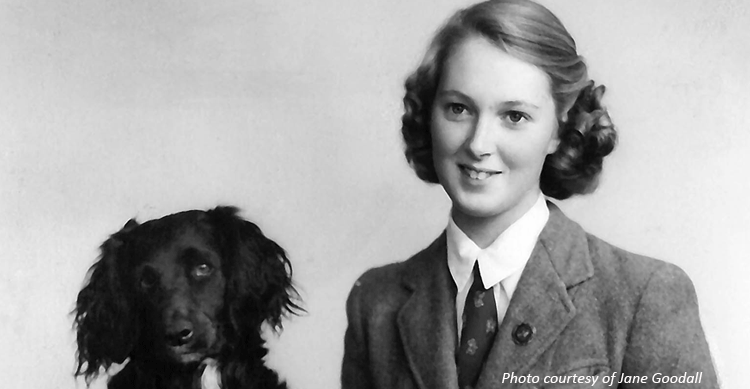 "When I was about 15 years old I offered to exercise a beautiful pure bred collie called Budleigh. His owner had a sweet shop, and she was not able to give him the exercise he needed, so she was really pleased when I offered to go after school each day and take him for walks. Collies are normally really intelligent, but Budleigh was not. I tried and tried to teach him to “Shake hands” – taking his paw as I uttered the command. But though I rewarded him with a tidbit each time, he just could not seem to understand. During our walks we were sometimes accompanied by a black dog who lived in a hotel around the corner from our house. He was a mixed breed, black with white on his chest. I never paid much attention to him until, one day when I was, yet again, trying to persuade Buds (as I called him) to shake hands. Buds just stared at me as I said “Shake hands” – but suddenly a black paw was reached out to me. It is a mark of intelligence when an animal learns not through being actually taught, but by watching another animal being taught. I was amazed. And from then on, Rusty became part of my family". Once Rusty knew what I wanted, he was always eager to do it seemingly just because it made me pleased. Indeed, a pat and a cuddle was as important to him as a food reward. Rusty was unusual in that he loved to be dressed up. I would put him into pyjamas, put a bandage round his head, and put him in bed. He went all floppy. We would gently stroke him, and say “poor Rusty” and he would half close his eyes, and play along. Sometimes I took him out for a walk, still dressed up, in an old pram. There was just one thing: of course, he looked really funny, but if you laughed at him he hated it. He would immediately walk way, trailing garments, so we had to hide our laughter. He was, in fact, very good at sulking. And he showed his feelings in a way I have not seen in any other dog – and I have known many. If I scolded him for something that he knew was naughty – like stealing a biscuit from the table, he acted very guilty, and rolled on his back and apologized. But if I scolded him for something that he had not yet understood was bad behavior – like putting a muddy paw on my knee - he would go and sit facing the wall, his nose almost touching it. I could say the words that usually got him all excited, like “Walkies”, or I could hold out a piece of food. He ignored me. I had to go down on my knees and embrace him, and apologize. He did this three times. I taught him to “Wait” and I could walk away, almost out of sight, and he would not move until I called him. Sometimes we played “hide and seek”. I told him to wait, and I went as quietly as I could and hid in the bushes. When I called he would rush about searching. Of course, he must have known where I was – he could hear where I called from. And sometimes he went by so close that he must have seen or smelled me. But he seemed to think it was more fun to go on searching! "Back then TV was new and very expensive. Eventually we got a very small one – it was black and white, no colour. Even so, Rusty would always watch with interest if it was a program about animals. The rest bored him, and he slept. We lived about 10 minutes from the sea, and Rusty loved swimming. I went swimming most days in the summer, and Rusty always came with me. Then we found that sometimes, when it was very hot in the summer, and if I was not around, he would take himself down to the beach, have a quick swim, and come home again. We knew because we spied on him, from a distance.. I hated going away. When I got a job in London, I went home almost every weekend, to be with the family – but most especially Rusty. Once he hurt his paw. We all made a big fuss of him. I was away two weeks, and was shocked to find he was still limping when I returned. Then I saw the family trying not to laugh. He had been quite well for at least a week – but seeing me, wanted some more special sympathy! I learned so much from Rusty. He proved to me that animals have minds, personalities and feelings. This gave me great strength in my convictions and work with chimpanzees. Rusty died before I went to Africa. I could not have gone had he been alive".